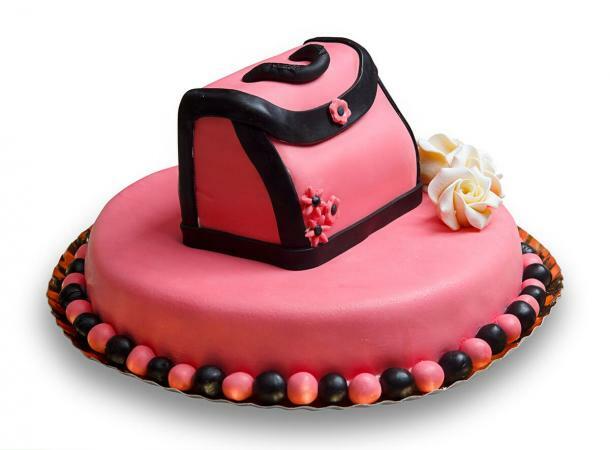 Ladies and girls who love handbags will find a purse cake the perfect accessory for their party. From a sophisticated black bag to a cute buttercream handbag to a pink purse, you're sure to find one design to fit her taste. 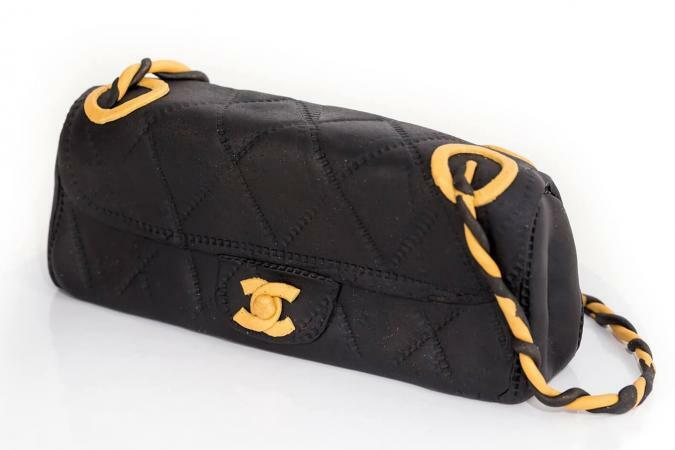 A traditional black Chanel-inspired purse is tasteful for a lady of any age. It's also an easy design that looks complicated but is made simple with the purchase of a simple embossing tool. It takes a lot of black food coloring to get the shade deep enough; save yourself time by purchasing pre-dyed black fondant. Which Brands of Designer Handbags Are Most Affordable? Start with a pound cake in a loaf pan. Allow it to cool and turn it on its side. Using a serrated knife, shape the top and sides so they are rounded like the purse. Cut a small section out of each purse "end." Coat the cake with a crumb coat of buttercream. Roll out black fondant to approximately 1/4" thickness. Lightly run the embossing tool diagonally across the fondant to create the diamond pattern across the cake. Carefully wrap the cake in the fondant and smooth. Press lightly into the ends of the purse so the fondant goes into the small space you cut. Use fork tines to create the seaming on the ends. Cut another piece out of the quilted black fondant to create the front flap of the purse. Again, use fork tines to create the seams. Attach the front flap to the purse using a little water or royal icing as an adhesive. Cut another smaller piece of the quilted fondant. It will serve as the clasp flap. Affix this to the cake using royal icing. Roll dark yellow fondant out. Cut two C-shaped pieces out and intertwine them as the picture indicates. Attach to the clasp flap with royal icing adhesive. Roll a small piece of the yellow fondant into a ball. Add this to the center of the C-shaped clasps using royal icing adhesive. Roll dark yellow fondant out into a rope shape. Make two rings and flatten them slightly to represent the o-rings for attaching the strap. Twist additional yellow and black fondant into a spiral for the purse strap. Attach the handle in the center of the o-rings and drape the rest of the strap across the cake board. A cake for a child or teen doesn't need to be ultra-sophisticated. Instead, use buttercream to make cute flowers around the bag. Accent with some candies to create a 3D effect. Bake and cool a pound cake or other heavy cake. Turn it on its side and shape with a serrated knife to create the rounded edges. Crumb coat the cake with buttercream frosting. Use a star tip and fuchsia-tinted buttercream to create large flowers around the handbag. Add a small piece of candy dipped in colored sugar for the flower centers. Use a small knife to make a little hole in the flower center for attaching the candy. A dab of royal icing will help hold it in place. Fill a pastry bag with yellow buttercream and a large star tip. Make stars close together around the entire cake. Add handles out of gumpaste or food-safe plastic. Place two small suckers in the center of the cake top for the purse clasp. A purse doesn't need to be demure or "cute" to top a cake for the lady in your life (or yourself!). Use your favorite color to add a special touch to the cake. Hot pink with black accents make this purse pop. The purse topper can be made from crispy rice cereal bars to keep it from weighing down the cake; you also won't need to have any carving skills. Cover a baked and cooled round cake with hot pink fondant. Cut two rectangular pieces of crispy rice cereal bars. Cut one so it's about 1/3 less wide than the other. Stack the two bars together, with the smaller on top, using buttercream to hold them together. Use the additional pink fondant to cover the cereal bars, shaping them as you cover so the final product resembles a handbag. Roll black fondant and cut into 1/2" wide strips. Cut to create the seams of the purse and add to the bag as shown. Don't forget to include the handle. Place the purse on top of the cake using a little dab of buttercream to hold it in place. Add small pink buttercream flowers to the purse corner and a couple icing roses for additional decoration. Roll black and hot pink fondant into circles for the cake border. If desired, add a message to the top or sides using royal icing. 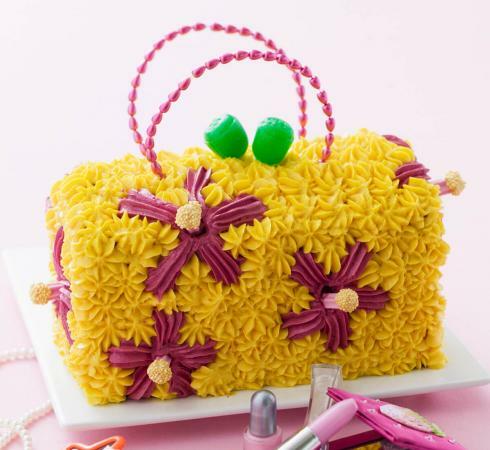 The purse cake you create can be as simple or elaborate as you desire. It can resemble a favorite purse, a designer bag you would love to have, or even be part of a larger cake that features other fashion and accessories. Accent the cake with special touches, like textured mats and edible glitter, to help make the cake a fashion statement worthy of any occasion.